The official housing company for Black Hat is Convention Housing Partners — the only company authorized to arrange hotel reservations for Black Hat Las Vegas 2019 attendees and sponsors. If you are contacted by any other company offering to make hotel reservations for you, we urge you not to book with them as they are not affiliated with Black Hat and therefore are not authorized to make reservations on Black Hat's behalf. While they may offer special rates, unauthorized third-party companies typically require non-refundable pre-paid reservations, charge cancellation and change fees, and move individuals to other hotels without notice. If you book with any of these unauthorized companies, Black Hat cannot protect you if there is a problem with your reservation when you arrive in Las Vegas. You may advise of any unauthorized solicitations via email. Need a ride from the Las Vegas airport to your hotel? 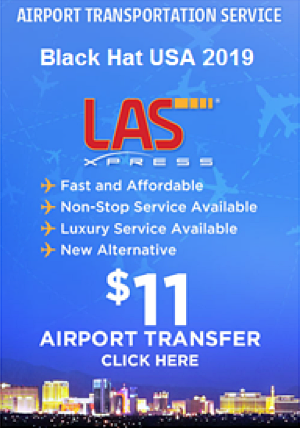 Black Hat USA 2019 has partnered with LASxpress to offer one-way airport transfers for as low as $11.00. Book now to receive this special rate.